It’s time already for our end-of-the-week blog! Nicole held down the Sugar Fix fort this week while Ashley, Tricia, and Hannah were all on holiday! It’s important for us to have these weeks every once in a while in order to get the entire office deep-cleaned, supplies ordered and re-stocked, phone calls made, etc. On Wednesday, Dr. Emery flew to Arizona to attend a continuing education course called, “Interdisciplinary Management of Esthetic Dilemmas.” Dentists from all over the United States are attending this 2-day course where the instructors are absolute experts in this subject matter. 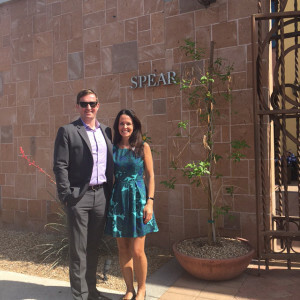 Dr. Emery & another dentist at the Spear Seminar in Arizona this week. “It’s the most popular scanner in the world,” says its manufacturer Sirona. This sleek piece of machinery was installed into our side office on Thursday. When we take our patients over to be scanned they can expect the process to be VERY easy and they should feel no anxiety at all in using it. Really, you just stand there! The scanner is capable of taking 2 dimensional and 3 dimensional images of the patient’s head, jaw, and teeth. This will be extremely beneficial for all of us for several reasons. For instance, we have some patients that have a hard time taking the traditional x-rays (sometimes due to strong gag reflexes, small mouths or tori- which is extra bone that grows in the mouth). This machine will be able to take a traditional x-ray of an area of concern with little to no strain on the patient! It’s here! It’s here!! 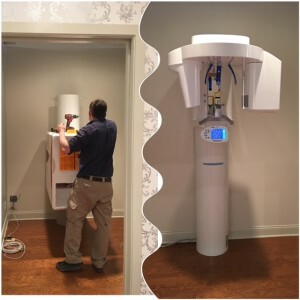 We’re so happy to have this beautiful new machine at Sugar Fix Dental Loft! Another AWESOME result of having and using this machine, is that the scanner will also be able to take 2 types of x-rays referred to as a Panoramic and a Cephalometric. These are fantastic when it comes to diagnosis of any sinus or wisdom tooth treatment. The Cephalometric in particular is great in showing the temporomandibular joint (TMJ) for our patients that suffer with discomfort in the jaw. Lastly, the most exciting feature of the machine is that it can “communicate” with our Cerec Software (The Cerec is the computer that makes crowns in 1 appointment) in order to make restorations on implant teeth. This is incredibly exciting, because it’s been something that always had to be done at a lab, thus costing the patient more time and sometimes money. With this upgrade, we will now also be able to restore implant teeth in one appointment! This is a HUGE benefit for our patients and this REALLY makes us smile!! All good things are coming our way this spring and we can’t wait to share them all with you! We wish you a lovely weekend!